Experience the new era of gaming technology with Deadstorm Pirates 4D+ from Namco. Enclosed in a booth, upto 4-players can immersive themselves in the game which features 3D graphics as well as wind, bubbles and motion effects to simulate a real-life swashbuckling adventure. Players take on the role of a pirate and must defeat their enemies with weapons including machineguns and cannons. The game can be played by up to 4 players cooperatively. When the game is being played multiple players, shooting at the same target together produces a more powerful shot. In the centre of the control panel is a replica helm of a ship which is used to change the direction of your ship during certain sections of gameplay. There are 5 stages to play through each with a variety of unique features, with the player able to select which stage they would like to play. The first four stages, "Stormy Sea", "Mountain Rapids", "Forbidden Cave" and "Giant Whirlpool" can be played in any order. Experience the new era of gaming technology with Deadstorm Pirates 4D+ from Namco. 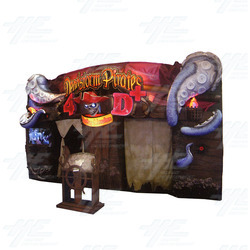 Enclosed in a booth, upto 4-players can immersive themselves in the game which features 3D graphics as well as wind, bubbles and motion effects to simulate a real-life swashbuckling adventure. Players take on the role of a pirate and must defeat their enemies with weapons including machineguns and cannons. The game can be played by up to 4 players cooperatively. When the game is being played multiple players, shooting at the same target together produces a more powerful shot. In the centre of the control panel is a replica helm of a ship which is used to change the direction of your ship during certain sections of gameplay. There are 5 stages to play through each with a variety of unique features, with the player able to select which stage they would like to play. The first four stages, "Stormy Sea", "Mountain Rapids", "Forbidden Cave" and "Giant Whirlpool" can be played in any order. This is a fan made video of the Deadstorm Pirates game from Namco which focuses on the Mountain Rapids stage, and the enemies visible in the video are leeches. This is a trade show video whihc shows you the over all view of the Deadstorm Pirates SD Cabinet from Namco. This fan made video is of the Deadstorm Pirates game from Namco which focuses on the Mountain Rapids stage and the enemies visible in the video are piranhas. Fan made video of the Deadstorm Pirates game from Namco that focuses on the Mountain Rapids stage and the enemies visible on the screen in this video are crabs. This is a trade show video that gives an overview of what the Deadstorm Pirates Cabinet looks like.